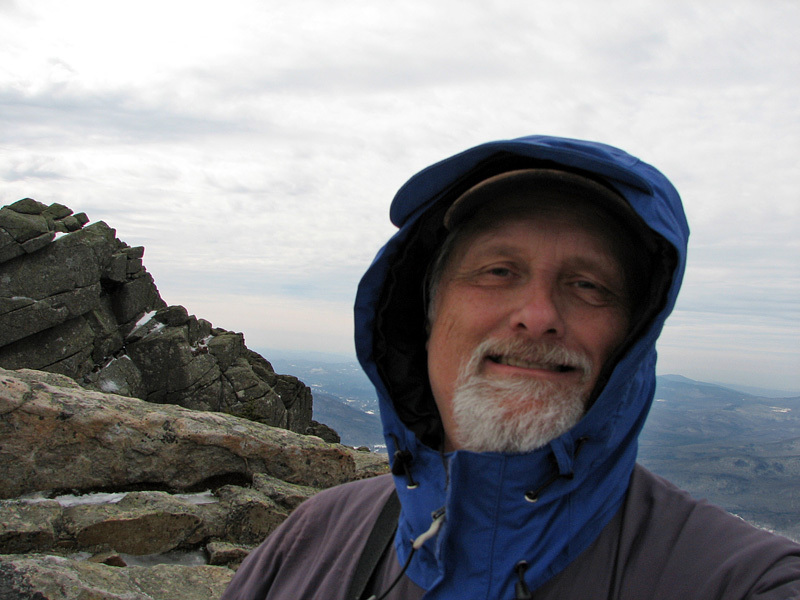 I hadn't been up to the White Mountains since the previous November and that trip had only been to the relatively low summits of Mts Sugarloaf and Pemigewasset, so I was anxious to climb one of the 4000-footers again. I chose Mt Liberty because it was close and because I knew that the trail would be well-packed out, and therefore firm. Instead of taking the usual route from the Flume via the Whitehouse Trail, parked at the Basin parking lot and followed the bike path south to the trailhead. The bike path was mostly icy with patches of bare asphalt. Once on the Liberty Spring Trail, which was quite firm and somewhat icy, I put on my Kahtoola Microspikes. Other than a quick test at a local trail near home, this was the first time I'd used them since trading in a pair of STABILicers after my November trip to the White Mountains. Unlike the STABILicers, they proved to be very useful, easy to put on and take off, and very light. The temperature was cold enough and the snow was so firm that I didn't have to worry about stepping off the packed center ridge of the trail that hikers often refer to as a "monorail" when the snow around it melts away. This made hiking particularly easy, as I didn't have to worry about postholing if I strayed from the middle of the trail. Although I knew the snow was still fairly deep, I couldn't tell how deep it was until I reached the Liberty Spring Campsite a couple of hundred vertical feet below the ridge. The tent platforms were still completely buried and only the top of the campsite's bulletin board peeked out of the snow cover. I sat down in the snow for a quick snack and drink of Powerade. Since I tend to perspire a lot, even in the winter, I almost always bring one bottle of Powerade or Gatorade on a day hike as an electrolyte supplement to the water I carry. And on overnights, I usually buy some powered Gatorade to add to a water bottle. 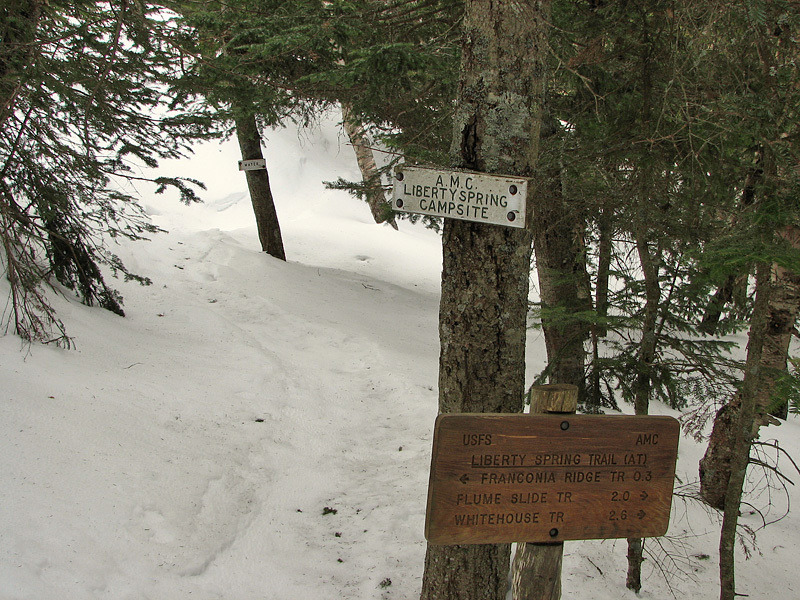 After my break, I continued up to the ridge, where both the Liberty Spring and Franconia Ridge Trail signs were even more deeply buried than the ones at the campsite. It's only a short 200 feet or so climb to Mt Liberty from the ridge junction, but the temperature difference was striking. Once I was out of the trees and onto the bare summit, the stiff wind blowing up from the notch caused me to hunker down in the lee of some rocks just so I could change the batteries in my camera, which had just then ran out of power, probably due to the cold. When the camera was working again, I quickly began to take as many pictures as I could in as short a time as possible. Liberty Spring Trailhead. The trail begins near the spot where the Franconia Notch bike path crosses Cascade Brook. The Whitehouse Trail from the Flume parking lot also ends here. 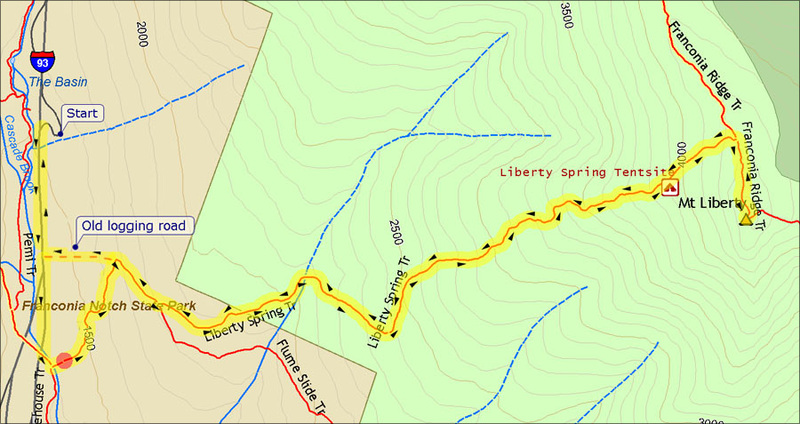 Liberty Spring Trail. 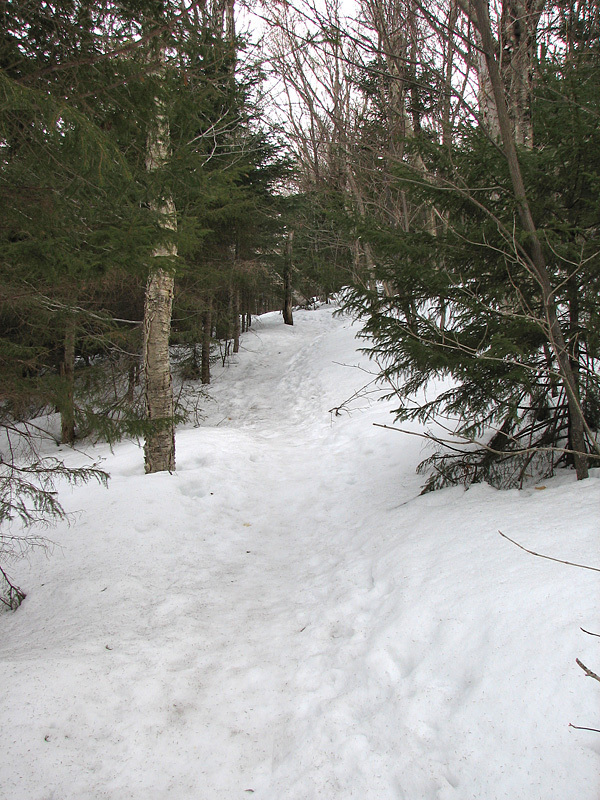 The temperature was cold enough and the snow was fairly hard and icy that I didn't have to worry about stepping off the center of the trail where the snow was most firmly packed. Liberty Spring Campsite sign. The tent platforms were still covered by the deep snow, and even the spring was hard to locate. Buried bulletin board. 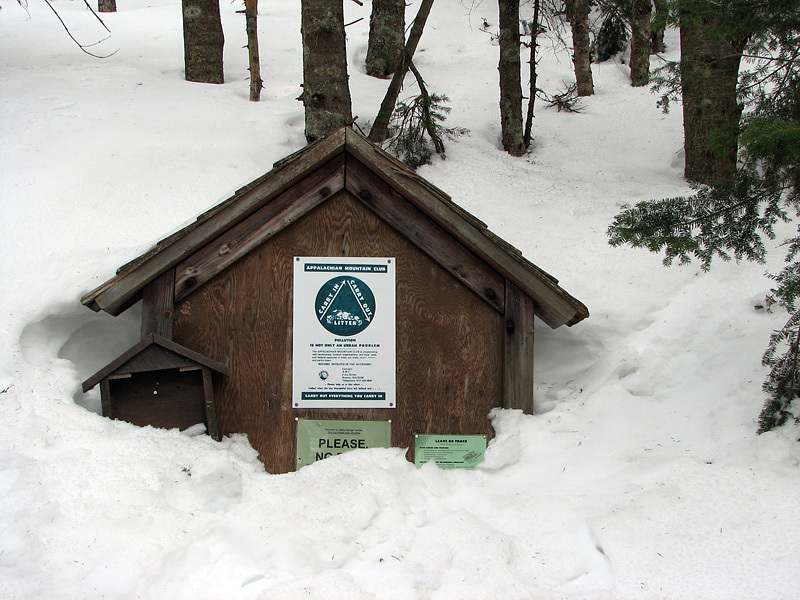 Only the top of the campsite's bulletin board, with its usual announcements and bear warnings, was visible above the snow cover. 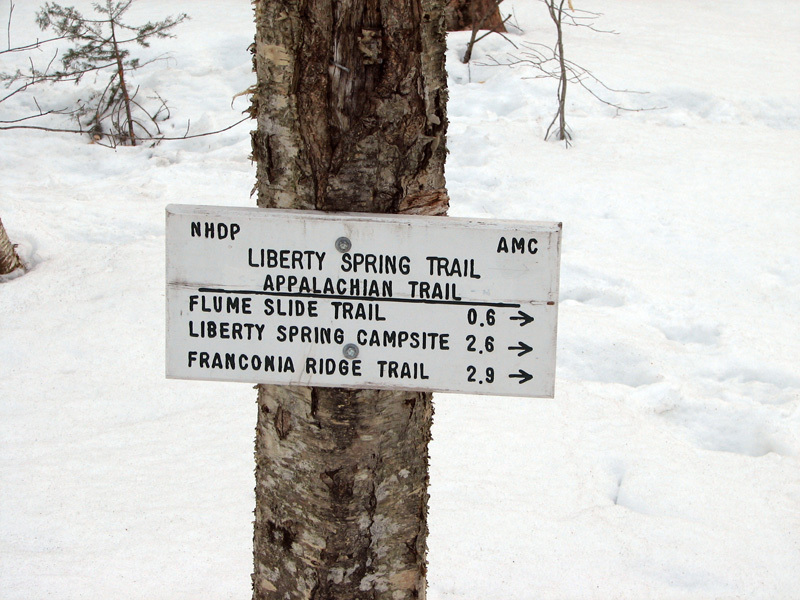 Liberty Spring Trail sign at the Franconia Ridge Trail junction. In the summer, this sign is about at shoulder height. 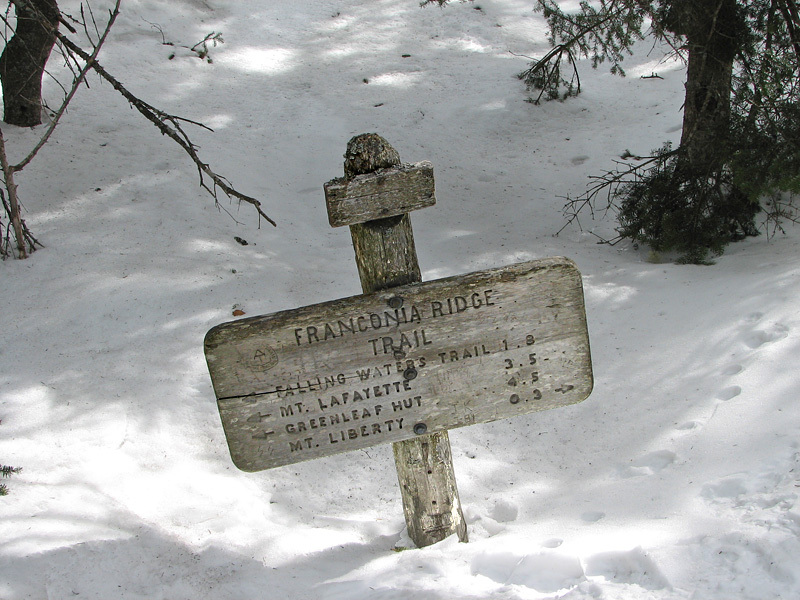 Franconia Ridge Trail sign. A little taller than the Liberty Spring Trail sign, one could still read all of this sign. Self-portrait on Mt Liberty. I was just below the actual summit here, in a spot where, if I kneeled down low, I was sheltered from the strong wind. Mt Liberty summit. Both Mt Liberty and Mt Flume have a lot of angular slabs of rock.